Located on the caldera cliffs in Imerovigli, Astra Suites offers a wellness center and an infinity pool with sun loungers on the terrace. Please note: the infinity pool is heated during the low season. Children can only be accommodated in certain room types for security reasons. Open-plan studio located on the ground floor with living room with sofa, bedroom with double bed (in some cases, in the loft) and terrace with views of the volcano, the Aegean Sea and the sunset. Includes 1 welcome Santorini wine bottle. The outside terrace is located on the ground floor, at the level of the pool. Although it is private, it is not isolated. 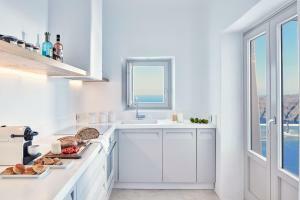 Suite with a living room, a sleeping area, a fully equipped kitchenette and a terrace with views of the volcano, the Aegean Sea and the sunset. Some are open plan, while others have a raised bedroom. It has a very spacious bedroom / lounge area and a private balcony or terrace with views of the volcano, the Aegean Sea and the sunset. Includes 1 welcome Santorini wine bottle. Some suites also have a loft. The outdoor terrace is on an upper floor, so it offers more privacy. Some of these suites can accommodate up to 3 people. Extra beds and baby cots are available for a supplement. Some accommodations are open-plan. This open-plan suite is designed in traditional cave style and has a seating area with satellite TV, 2 bedrooms and a balcony or terrace with views of the volcano and the Aegean Sea. It also includes a fully equipped kitchenette and free Wi-Fi. The outdoor terrace is on the ground floor. Although it is private, it is not isolated. The indicated rate is for 2 people. Children will have to pay a supplement for accommodation (see the conditions of the establishment). This suite features a very spacious lounge with local artwork, a king-size bed and a private balcony with views of the volcano, the Aegean Sea and the sunset. It also includes a welcome bottle of Santorini wine 1. 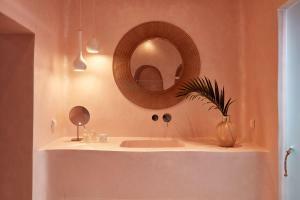 In some suites there is a romantic shower. This suite has a very large living room, bathroom and large dressing room and panoramic porch with hot tub for 2 people and views of the volcano, the Aegean Sea and the sunset. Includes 1 welcome Santorini wine bottle. This suite features a very spacious living room, a large bathroom, a dressing area and a panoramic porch with a private heated pool and views of the volcano, the Aegean Sea and the sunset. It also includes a welcome bottle of Santorini wine 1. The private pool is heated only in low and medium season. The private Astra villa, located about 500 meters from the Astra Suites Hotel Complex, overlooks the caldera, private pool and outdoor hot tub. This villa of 180 m² consists of 2 bedrooms, air conditioning, 2 king-size beds (one of them can be separated into individual 2, if desired), 2 bathrooms in the bedrooms and another bathroom, all equipped with luxury toiletries and hair dryer. The pool can be heated during the off season months.